Blowout Sale! 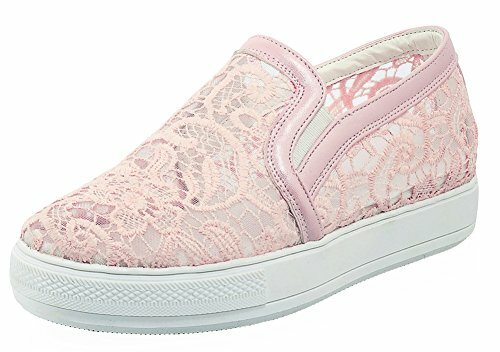 Save 61% on the SHOWHOW Women's Comfort Round Toe Slip On Sneakers with Mesh Pink 9 B(M) US by SHOWHOW at SCRHI. Hurry! Limited time offer. Offer valid only while supplies last. A woman is not well-dressed without a pair of right shoes! Do you want to be a sweet and graceful girl or woman? Welcome to our shop to choose shoes! A woman is not well-dressed without a pair of right shoes! Do you want to be a sweet and graceful girl or woman? Welcome to our shop to choose shoes! These SHOWHOW Women's Comfort Round Toe Slip On Sneakers With Mesh can't wait to give you a surprise. This shoes features so so breathable mesh and round toe, which brings you not only fashion but comfy experience. The shoes is easy to match and put on and take off. What's more, you can wear them for wedding, party, prom and club. Why not have a try to change other style? You worth it!